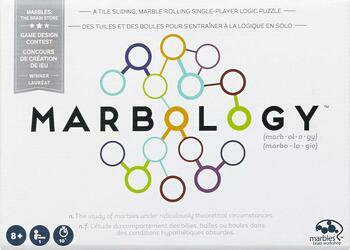 Marbology is a solo puzzle using resin tiles to slide. The 52 Challenges, with evolutionary difficulty, offer you to roll the balls from their starting positions to their arrival zone (their houses). To do this, slide the tiles inside the grid to create paths to deflect the balls between the cavities. Solve the puzzle by giving all the balls a clear path to their homes. Your logical skills, visual perception and mental development will be of great help. So, take a challenge card, set up the grid, place your marbles and see if you can find your way! Contents of the box : 9 colored balls, 15 Tiles/Double sided tiles, 52 puzzle cards, 1 wooden storage box, 1 instruction manual.